In the past, I provided readers with a simple link they could double-click to send me an e-mail message. Because spammer computers can scan my website and pick up my e-mail address, I have decided to drop the link to my e-mail address on the website to thwart the spammer and reduce spam messages. Unfortunately this means you cannot just double-click on a link but must type the e-mail address in your e-mail software. 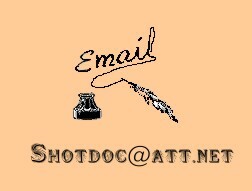 Below is a picture/graphic that provides you with my Shot Doc e-mail address. Please type the e-mail address below the inkwell graphic into your e-mail software to get me a message. Thanks for looking over my cowboy website. I look forward to hearing from you.